The Scouting community rallied to Houston’s side in 2017 after Hurricane Harvey. A year later, when an Eagle Scout from Houston heard about the wildfire in Northern California, he was determined to return the favor. Rafe Kotalik, senior patrol leader of Troop 1772 from the Sam Houston Area Council, launched a massive gear drive for Scouts and others from Paradise, Calif., who lost everything in the blaze known as the Camp Fire. Rafe and his dad, John, also an Eagle Scout, flew to California in December to personally deliver the gear. In February, they plan to go back with even more supplies. “I loved knowing that we were helping them to rebuild so that they would have supplies to resume their Scouting adventures,” Rafe says. Even though Rafe’s efforts are grand enough to be an Eagle project, Rafe’s already an Eagle Scout. He did this because he cares about helping others. In late November 2018, Rafe approached his patrol leaders’ council to suggest the gear drive. “We have a duty to serve the needs of fellow Scouts,” he told them. With an enthusiastic thumbs-up from his fellow youth leaders, and the OK from his Scoutmaster, Rafe created an Amazon wish list for the affected Scouts. This allowed families in Rafe’s troop to easily purchase and ship items like tents, sleeping bags, hammocks, backpacks and cooking gear straight to Scouts in the Golden Empire Council. But Troop 1772 was just getting started. Rafe and his fellow Scouts began collecting items to deliver in person. Members of the community donated camping stoves, blankets, cooking gear, cots and chuck boxes. The local fire department chipped in, too, with personal first-aid kits and flashlights. Donations in hand, Rafe and his dad loaded everything into eight large cardboard boxes and headed for the airport to catch a flight to Sacramento. Rafe asked Southwest Airlines to waive its excess baggage fee, and they agreed. After landing in California, Rafe and his dad were greeted by six deputies from the Sacramento County Sheriff’s Department, who escorted the father and son to their gear. The group drove through the California communities of Oroville, Magalia, Paradise and Chico to deliver it all. Rafe spent time with students from Paradise Elementary and Pine Ridge Elementary. Rafe, wearing his full Scout uniform, distributed a gift box to every student. 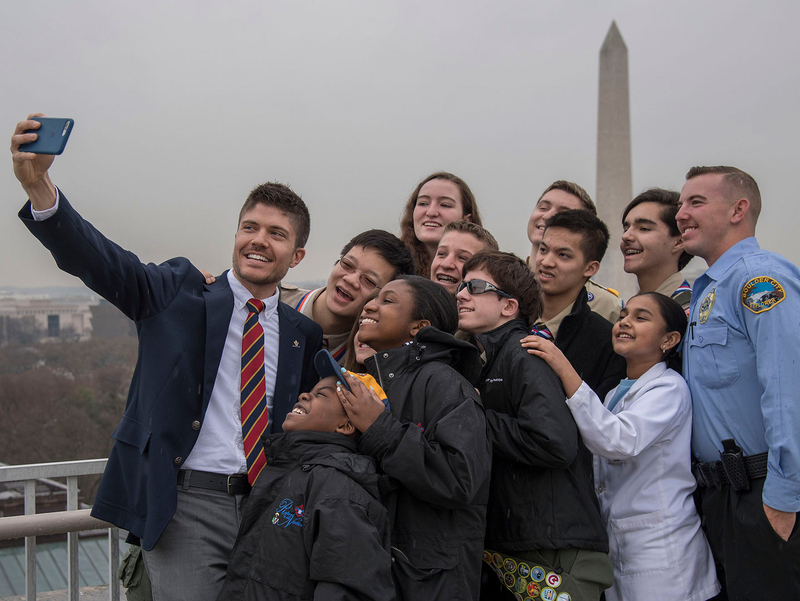 “Many were curious about Scouting, and I was happy to answer their questions,” he says. Rafe next met members of Troop 316, based in Paradise. He passed out stockings and blankets to each Scout, along with other gear his troop back home had collected. “They welcomed me like I was part of their unit,” Rafe says. Rafe’s dad, John, says the destruction in Paradise was worse than he saw on TV. 450 service hours by members of Rafe’s troop, friends and family on this project. 800 items were gathered to fill stockings for Scouts and other young children. 1,500 craft activity kits were assembled to provide gift boxes for each child at Pine Ridge Elementary and Paradise Elementary. 30 Scout gear items were purchased and donated to a Boy Scout troop that lost all their gear. New toys for 50 children and nearly 150 pet care items were given to area distribution centers.